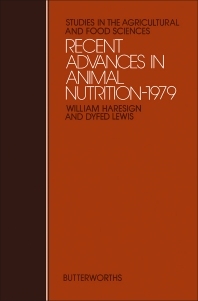 Recent Advances in Animal Nutrition-1979 is a collection of studies that tackles the nutritional concerns of both ruminant and non-ruminant livestock. The book presents a total of 11 materials that cover the measurement of nutritional value of feeds up to the inter-relationships between nutrition, body condition, and reproduction of livestock. The text first tackles the nutritional availabilities in livestock diets, and then proceeds to dealing with covering topics related to energy value of feeds, such as energy evaluation of cereals for pig diets; developments of the metabolizable energy system for ruminants; and predicting the metabolizable energy value of feeds for ruminants. The book also covers the effects of cereal processing and growth stimulants on the efficiency of ruminant production. The selection will be most useful to both researchers and practitioners of animal related disciplines, such agriculture and veterinary medicine.